Councillor Pol O Gribin with Caitríona McCrickard. 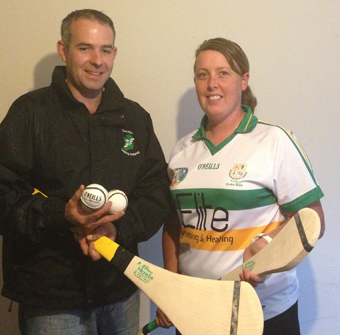 Sinn Féin Councillor Pól O Gribin pictured with Poc Fada competitor Caitríona McCrickard who competed in the competition on Saturday 3 August) at the Cooley Peninsula. Caitríona, who represented Ulster and Liatroim Fontenoys GAC, was sponsored two Camogie sticks and a number of Sliotars by the Drumgooland councillor for the event.